The 2015 Walter Atkinson Award was presented to Dr Roger Neill for his paper “Preliminary Analysis of Imagery Data arising from the 2014 Internal Investigation of HMAS AE2, presented at a meeting of the Victoria Section. 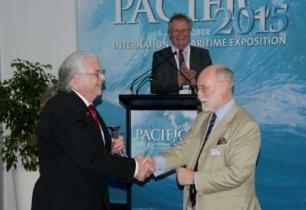 The Award was presented by Chief Executive, Trevor Blakeley, at the 2015 International Maritime Conference Reception. In May/June 2014 an internal investigation was undertaken of the sunken submarine HMAS AE2, which lies in 73 metres of water in the Sea of Marmara, Turkey. This investigation was undertaken as part of "Project Silent Anzac" under the coverage of the AE2 Commemorative Foundation Limited (AE2CF), with full approval of both Turkish and Australian governments, and it was undertaken in accordance with currently-accepted maritime archaeological practices. The scientific methodology adopted for the survey was based upon a "progression intrusion" principle whereby baseline measurements were made with the submarine in as near as possible its undisturbed state, and then the upper hatch was opened to enable remotely-deployed sensing technology to progressively and systematically investigate the interior of the submarine. The full paper may be downloaded here.